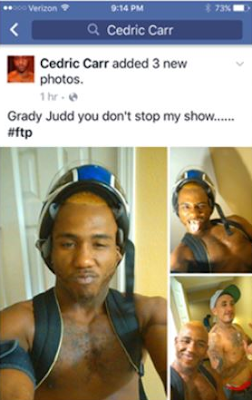 Cedric Carr before his arrest Polk County Sheriff Grady Judd wasted no time taking a jab at a career criminal who had taunted him on Facebook. Sheriff Judd took to Facebook to announce the arrest of Cedric Carr, of Mulberry, in a slightly different way. “It’s not usually a good idea to taunt the Sheriff’s Office on Facebook. Yes Cedric Carr, we stopped your show…” wrote Sheriff Judd on Facebook. On March 9, detectives with the Polk County High Intensity Drug Trafficking Task Force arrested 26-year-old Cedric Carr. Police followed up on a lead about Carr, who was wanted for several felony warrants and believed to be selling meth. Carr is facing 14 charges, ranging from possession of a firearm by a convicted felon, to grand theft auto. 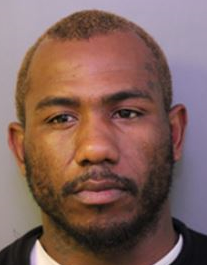 He has been arrested 14 times in Polk County, has 15 felonies, and 14 misdemeanors. He also spent time in Florida State Prison two times.